If you order fruits and flower hamper, it would likely cost you a few hundred ringgit. Ordering online is no doubt convenient but much more pricey as the online shop would need to factor in delivery charges, in case your area is not easily reachable via courier. I chanced upon the fruit and flower below that was prepared to be collected by a lady. It was custom ordered from a florist who sold flowers in the marketplace. Both of them were behind me as I took this photo with my BB and they smiled as I was admiring the hamper. She then took the finished hamper home. When asked what was the occasion, she mentioned it was UK’s Mother’s Day. Guess how much the hamper in the picture above are sold for? It is sold for RM100 only. 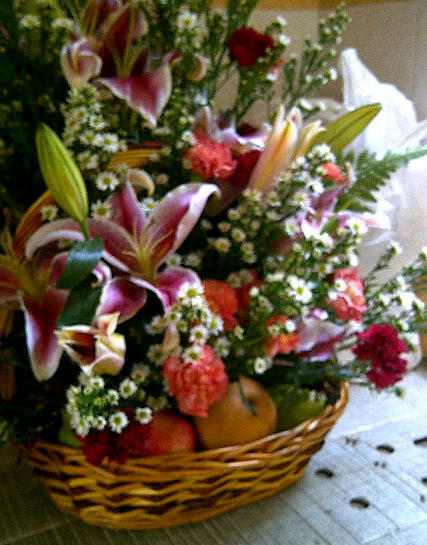 That also according to the florist was due to the basket itself costing RM20. And the flowers on it are tulips and fresh huge apples. Of course some florist from the marketplace may produce shoddy work- that is why for flowers and hampers people wanted to pay for consistency. In this case, the florist had been in the trade for decades, and I doubt she had any formal training. She may have just gotten on the job to earn a honest living and perfect her craft along the way.